Kiwifruit, loaded with vitamin C (2X the amount of orange), dietary fibre, potassium, folate, vitamin E, carotenoids and other antioxidants. It has low GI and is low in fat, and calories (<60kcal/100g). I would certainly like my family to have more. Oh we’ll, I feed slightly steamed Kiwifruit mixed with cereal and milk to my baby as breakfast. Serving fresh Kiwifruit as afternoon snack, too, sometimes. He liked it, if the pick wasn’t too sourish. Ha. As for cooking a dish with kiwifruit, I wasn’t too sure as it sounded too limited for choice of having it cooked as a briny dish instead of salad or sweet dessert. I knew too little, perhaps. The sauce of “咕咾肉” (Sweet & Sour Pork) came to my mind, and I was confident that I could improvise something of of this though. Not for pork this time, I preferred chicken to go with kiwifruit… but of course, stick to pork is fine, too. 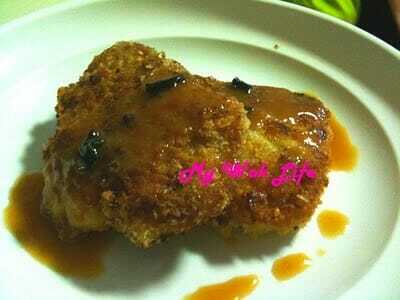 1) Marinate chicken fillet cubes with chicken granule, oyster sauce and sugar. Combine well and keep in the refrigerator for at least 30 min. 2) Divide ⅓ of the diced kiwifruit and mango out to keep aside for later. Blend the remaining 2/3 each of the fruit with water. Pour mixed fruit juice into a bowl, and add sugar (final amount depends on the natural sweetness of the fruits you are using), Worcestershire sauce, salt and pepper. Stir well and combine and set aside for later. 3) When chicken cubes is well marinated. Thickly coat the marinated chicken with corn flour. Heat wok with oil over medium fire. Deep fry coated chicken till golden brown. Drain oil on kitchen towel. 4) Discard excessive oil in wok and leave only 1 tablespoon of oil. Reduce heat to low fire. Add garlic, and sauté till fragrant. 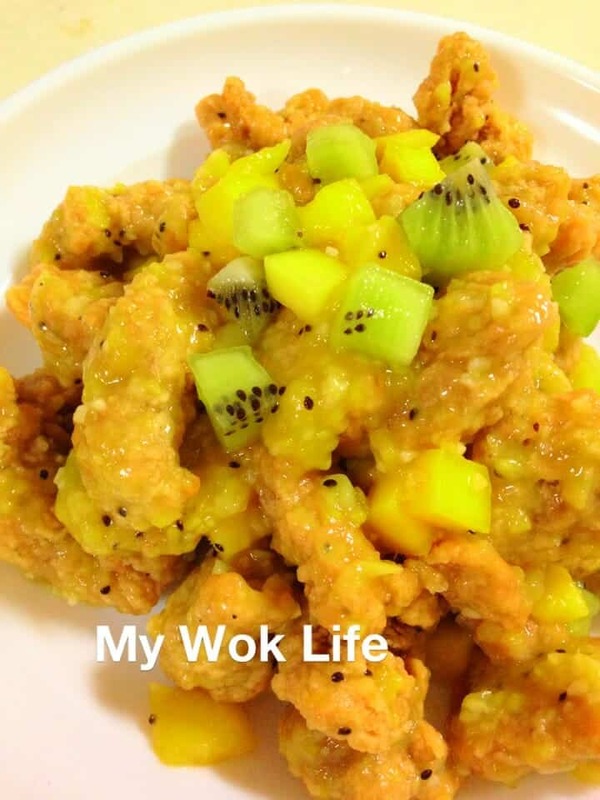 Return fried chicken cubes to the wok, followed by fruit sauce. Stir fry a little to combine chicken with sauce. Lastly, gradually add cornstarch slurry to thicken the fruit sauce, to your desire. Dish up and serve immediately. Simple, fruity and refreshing chicken dish! Oh yes, you’ll like it, your kids will like it! Tips: To make an express cooking, use frozen “popcorn” chicken by CP brand or New Moon brand. Simply bake the frozen chicken at 150° C for 15-20 min. CP brand or New Moon brand can be found at major supermarkets e.g. NTUC Fairprice, NTUC Finest, Sheng Siong, Shop n’ Save, and some neighborhood mini marts. * Zepris® Kiwi is available at major supermarkets e.g. NTUC Fairprice and Sheng Siong supermarket. It comes in a punnet of 6, usually. * Cook the sauce separately and pour onto the fried chicken cube only upon serving, if you aren’t serving it immediately. * It’s not necessarily to add all the cornstarch slurry for sauce thickening. On contrary, add more water to blend the fruits, if you like to have a more saucy dish. This is a vegetable dish which I loved most. We always eat this whenever dining out in a particular “Zhi Char” stall (Local Chinese stir-fry stall) nearby. They cooked it really simple and nice, especially the crispy dried shrimps, it really does complement the steamed rice so greatly! However, paying S$8 each time for my regular ordering of this simple French bean with just the dried shrimps, I did feel the ouch… Hence….. Needless to say, I tasted, and tried cooking it at home, of course. Simply head to the supermarket, get packet of French bean (S$1.50) and a handful of dried mini shrimps (S$0.20), you are now ready to cook a simple and delicious dish at home on your own! 1) Heat wok with oil over high fire. 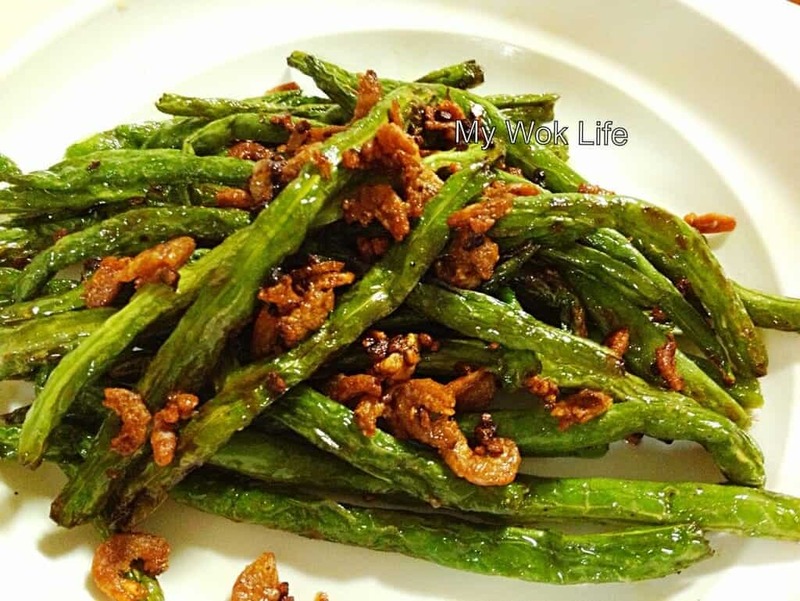 Fry French bean till cooked with shrinking and darkening appearance. Transfer out, drain on kitchen towel, and set aside. 2) Same wok, fry the dried shrimps till browned and crisped. Transfer out and drain on kitchen towel. 3) Remove oil from wok, return dried shrimps and French bean. Drizzle salt and chicken granule, stir fry to combine well. Heat off and dish up. Serve. 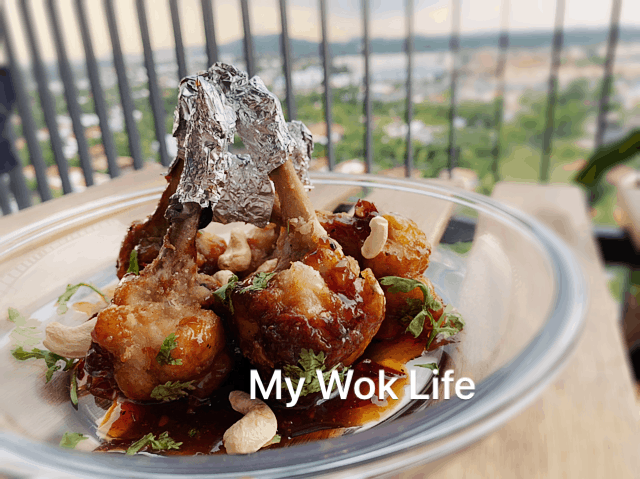 Here’s the outcome, and I am proud to share my cooking and recipe with you… If you are, looking for a similar dish with a much cheaper home-taste option, try this. Tips: In fact, stop the cooking at step 2 is fine, too. You don’t really need the seasoning though.. Have the most natural flavor of the ingredients! Simply arrange the French bean in a serving dish and top the dried shrimps on it, this can be a yummy light tasting dish, too! 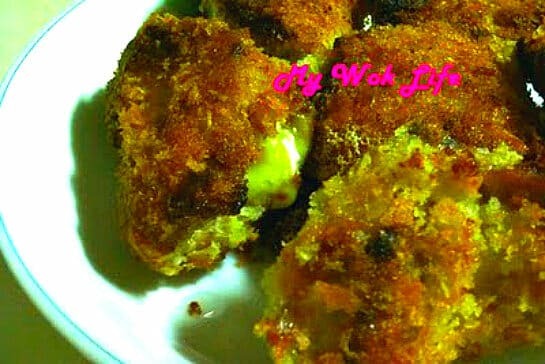 I was so excited to introduce to you my latest dish, the mini cheesy sandwiched pork cutlet! Yes, I did not make the standard sized pork chop, and instead, the bite-sizes. I wanted it to look cute. Most importantly, it was because I did it in a way that the pork chops were steamed beforehand. Just like my Japanese pork cutlet dish, it was easier to deep fry the crust to almost perfect golden by not worrying if the meat was cooked or not. Well, you may think this is an extra step which might not be necessary to you, do the ‘raw’ way may give you your better dish instead. It’s your comfort choice though.. Anyway, since school is out, soon… Go ahead to fill your picnic basket with these savory mini pork cutlet ‘sandwiches‘. No more ordinary bread sandwiches for picnic, this crispy sandwiched pork cutlet was simply aromatic and crispy. Its rich but not overwhelming cheesy content was good enough to just eat it on its own. 1) Use the back of the knife or a meat pounder to lightly pound on the both sides of the pork chops. Brush honey on both sides of each pork chop. Sprinkle salt and pepper on both sides. Season for 15 minutes, if desired. 2) Place pork chops on a wire mesh steam rack with stands so that you can put the steam rack directly in the wok filled with 1/4 full of water to steam with placing the chops on a dish. Otherwise, use electrical steamer. Steam pork chops for 5 minutes. Remove pork chops from wok, let it cool. 3) Place a piece of steamed pork chop on a clean top surface. Roll and place half slice of cheese on the pork chop and fold the pork chop half. Then, take a toothpick and prick through the opening of the folded part so that it holds. 4) Mix pinch of salt to the cornstarch. Coat some salted cornstarch on both sides of the chops. Then, dip into beaten egg, followed by coating a thick layer of breadcrumbs on all sides. Repeat step for all the remaining chops. Place coated chops on a large dish to rest for 5 minutes before cooking. 5) Heat wok with oil over medium fire. Place pork chops in the oil and fry till golden browned. Or, use deep fryer to fry for about 1 minute. Remove from oil and drain on kitchen paper towel. Remove the toothpick pricked on each chop. Serve with mayonnaise, if desired. Use those sliced Cheddar cheese, or get the grated ones. Both are fine to be sandwiched. If desired, mix more than one kind of cheese, how about an addition of Mozzarella? 1 piece of my mini cheesy pork cutlet counts about 180kcal. Tips: If you are using raw pork chop without steaming it first, extend frying time to 3 – 5 minutes with low-medium heat. Gradually, I learned to save such effort in some of my cookings. I finally believed that as long as the ingredients are fresh, it is not a must to marinate or marinating for long hours. Once again, I am convinced with the theory. This pork cutlet was not marinated beforehand. It was as simple as just brushing some honey on the chops, I got myself a very flavorsome fried pork cutlet, still! Well, not forgetting that I had my savory Miso sauce topped on it, of course… (chuckles). And, there is a special trick, to save your oil for frying the cutlet, an easier way to achieve its golden appearance, with even shorter frying time! 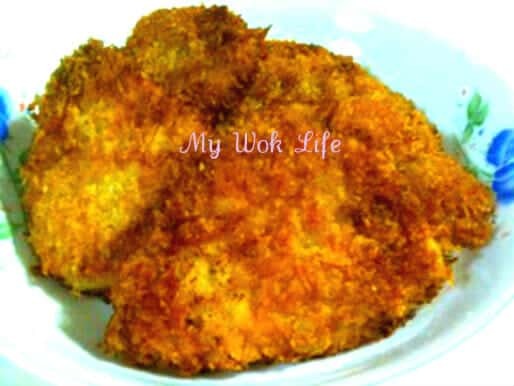 SIMPLE, flavorful, new easy tricks to get the most delicious crispy Tonkatsu here! * Mix the above and stir well. 1) Rinse and pat dry the pork chops. Use a knife to lightly cut a few slits on the entire surface of the chop. Then, use the back of the knife to lightly chop on the surface crosswise. On both sides, brush with honey. Set aside. 2) Get ready your electrical steamer or wok filled with boiling water on stove (with fine wire mesh steam racks in wok). Place the pork chops directly in the steamer or on the steamer rack without a plate. Cover with lid. Steam for 3 minutes. When done, remove from steamer and set aside to let it cool a little. Steam pork chops in batches, if steamer is not big enough. 3) Dust some flour on both sides of the chop. Then, dip the whole chop into the egg solution, followed by coating breadcrumb mixture on both sides again. Repeat steps for all the remaining chops. Leave all coated pork chops on the large dish to stand for 5 minutes before frying. 4) Heat wok with oil on medium fire. Place pork chop into wok to fry for 1 minute, flip over to fry for another minute, till both sides turn golden brown. Drain oil on wire strainer, and then, place on serving dish. Drizzle 1 tablespoon of my Special Miso sauce, and serve with my Mango & Strawberry Salsa, or steamed Japanese white rice. A piece of my Tonkatsu counts about 180kcal. * French loaf has to be blended (as finely blend as possible, but it’s ok to be a little coarse for more interesting crunchy bites) using electrical blender, before mixing with the store-bought fine crumbs. Alternatively, use cream crackers. I used seaweed flavored cream crackers for extra flavor, but the choice is yours. Using cornflakes to coat prawn fritters makes the dish special and imaginably delicious. The cornflakes crust created a much more crispy texture and aromatic flavor in the palate than the flour or bread crumbs coating. 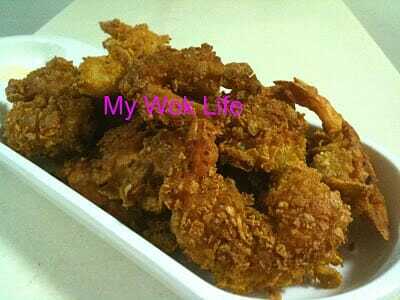 I learned this delicious cornflake prawn fritters dish from an adaption of recipe in a small fast food recipe book complimentary with the purchase of a lifestyle magazine. 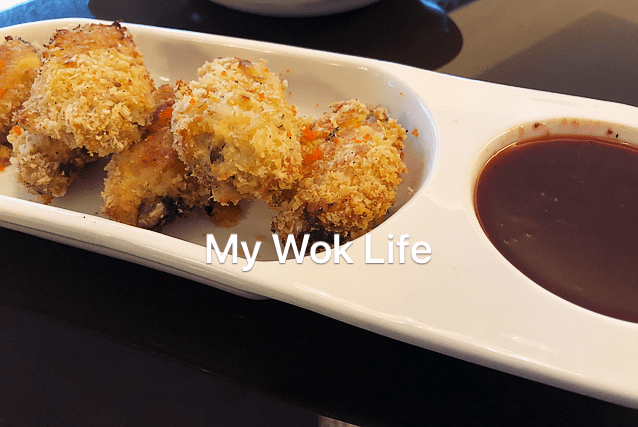 My family loved this version of deep fried prawn fritters so much. This recipe was indeed sugaring our meal last evening. The whole dish with servings for 4 was mopped up by just 3 of us in the end of the dinner. 1) Marinate prawns with the listed seasoning, for at least 20 minutes. 2) Mix plain flour and baking powder in a large bowl. Make a well in the centre and pour in vegetable oil. Cover with flour mixture. Gradually add in water and mix well to create smooth batter. Consistency of batter should be smooth with resistance. 3) Heat wok with oil over high fire. Reduce heat to medium-low fire when oil heated enough. Dip the whole prawn into batter then coat well with crushed cornflakes. Place coated prawn into heated oil and fry till golden brown. Repeat step till all prawns are done. Drain fried prawn fritters on paper towels. Serve with apple yogurt or mayonnaise as dipping sauce, if desired. A tail of conrflake prawn fritter counts about 95kcal. Tips: Crush cornflakes with fork or get a blender to do the job, but do not ground the cornflakes. Crush till tiny pieces will do, it makes the fritters apprear more delicate looking. However, if preferred crunchier and fuller biting on the crust, remain cornflakes in original whole pieces (but be reminded that it will be more difficult to coat with large pieces).